Over the last week some pictures of Google Play Gift Cards were uploaded with a hint that they will be launching soon. Google has now made the Gift Cards available to purchase. At the moment they appear to be available in three amounts of $10, $25 or $50 and allow the receiver to purchase apps and other content from the Google Play store. * Explore millions of songs from top artists, thousands of your favorite movies and TV shows, the world’s largest selection of eBooks, and much more. Play your purchases instantly on the web or on the go — no need for wires or syncing. 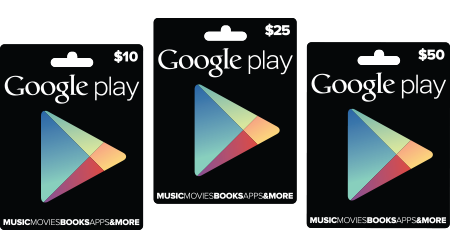 * Shop for all the Android apps and games you love with your Google Play gift card. You can even use it to purchase extra levels, add-on packs, and virtual currency. Although you can purchase a number of items with the gift cards, Google does have restrictions on using them for hardware, app subscriptions as well as magazine subscriptions for some reason. The cards are available at RadioShack, Target and GameStop at the moment.